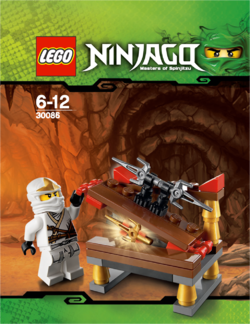 30086 Hidden Sword is a Ninjago set released in 2012. This set includes Zane ZX without his shoulder guards and a double-bladed sai like the one included in 9551 Kendo Cole. Another weapon included is a single golden sai. It seems that Zane is opening up a chest and finds the golden sai. This set also includes many gold and red pieces. It was first released free with the Kaczor Donald (Donald Duck) magazine during Feb/March 2012 in Poland, and released in the UK on May 26 as part of The Sun / News of the World Promotion. In the month of July, it was give away free at Toys R Us with a $20 purchase. In the bag art, Zane has Sensei Wu's legs from Destiny's Bounty. Facts about "30086 Hidden Sword"
This page was last edited on 12 January 2016, at 18:55.